Useful information for those of us focused on immersion in technology! Step 1 - Log into Google account. Go to: www.google.com/alerts. Step 2 - Enter the search information. Type: Select the type of search - comprehensive, image, video, blog, groups, news, internet or comprehensive. E-Mail Length: # of returned search items - 20 mentions or 50 mentions. Deliver to: Your preferred e-mail address. Step 3 - Review e-mailed alerts. Step 4 - Manage alerts. 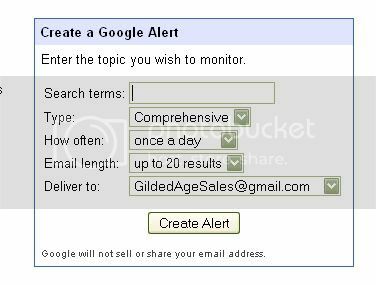 If you are receiving too many or too few alerts, change your search terms for the alerts. Alternate Search: OR - "Second Empire" or "Federal"
Wild Card Search: "* with a mountain view"
Identified Competitor Copying and Pasting Market Report. Discovered Long Forgotten Media Video Clip of One of Our Agents. Discovered Misuse of Craigslist Posting by Unlicensed Real Agent and by Rental Scam Artist. Discovered Problem with Trulia Feed Directing Leads to Competitor's Website. Found Article on Past Client regarding New Development Project. Identified Buyer for Commercial Property. Found Negative Comments regarding a Development in Area. Identified End-User Subscribing to RSS Blog Feed. 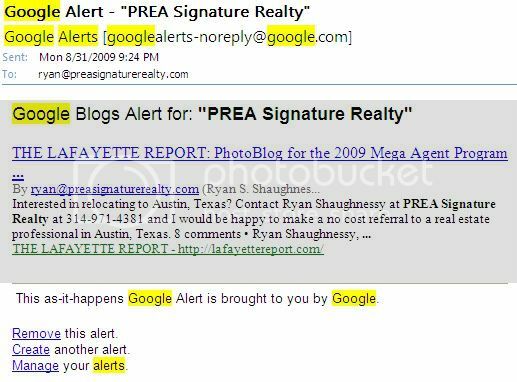 INTERESTED IN LEARNING MORE ABOUT HOW TO USE GOOGLE TOOLS IN THE MARKETING AND SALE OF REAL ESTATE? Contact Ryan Shaughnessy at 314-971-4381 or send an e-mail to Ryan@PREASignatureRealty.com. Google has it all --- They are taking over quickly! Thanks for sharing! Tony: Very comprehensive post. You keep doing this and you'll have enough for a book! Norma J. Elkins I was remiss in the early days - just now catching up with comments from blog posts since day 1 - thanks for the comment - hope you are still in the 'Rain! Catherine "Cathy" Chaudemanche- Edison I was remiss in the early days - just now catching up with comments from blog posts since day 1 - thanks for the comment - hope you are still in the 'Rain! R. Michael Brown I was remiss in the early days - just now catching up with comments from blog posts since day 1 - thanks for the comment - hope you are still in the 'Rain! Great comprehensive post. Shared it everywhere!